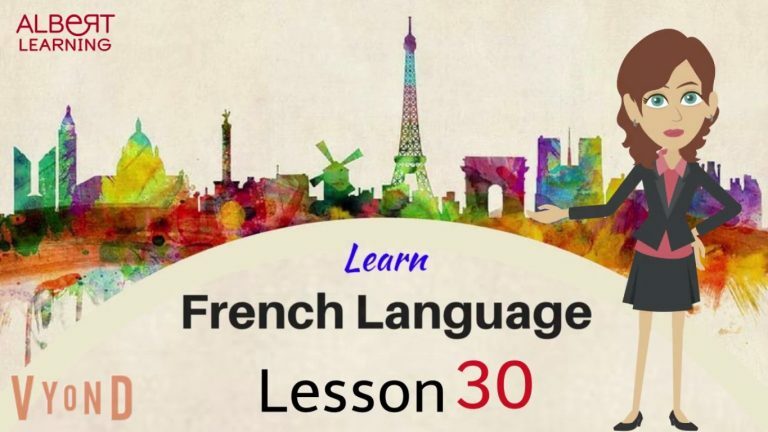 Watch Your Way To Learning French–Part 30! Author AlbertPublished on 15 April 2019 16 April 2019 Leave a comment on Watch Your Way To Learning French–Part 30! Do you want to host a party for your friends? With this lesson, learn how to have a conversation in French about hosting a party. What are you waiting for? Watch now, host a party and have fun! Solve the exercise and write your answers in the comment section below. Exercise: Write the correct English translation of the following words. 5) Oui, j’en suis sûr! Don’t forget to number your answers correctly! Good luck! Visit our website (www.albert-learning.com) for more such lessons! Click here to read the previous post. Published on 15 April 2019 16 April 2019 Categories Learn FrenchTags Albert learning, Basic French words, French conversation, French courses, French language, French lessons online, French vocabulary, Learn French, Learn French online, online French coursesLeave a comment on Watch Your Way To Learning French–Part 30! ﻿Watch Your Way To Learning French–Part 29! Author AlbertPublished on 5 April 2019 13 April 2019 Leave a comment on ﻿Watch Your Way To Learning French–Part 29! Are honks, screeches, and the loud voices ruining your conversation with your new French buddy (as if comprehending French wasn’t hard enough!)? Beat the noise with this next lesson by Albert Learning. Exercise: Write the correct English translation of the highlighted words. 1) Il y a beaucoup de bruit ici. On peut aller ailleurs. 2) On peut aller à un lieu un peu silencieux. 3) Tu as raison. Ça sera mieux. 4) Tiens mon bras. Nous allons traverser la rue et aller tout droit. 5) Il y aura assez de place pour nous là-bas. 6) En fait, il y a même quelques bons restaurants dans ce quartier. Click here to read the previous blog. Published on 5 April 2019 13 April 2019 Categories Learn FrenchTags Albert learning, Basic French words, French courses, French language, French lessons online, French vocabulary, Learn French online, online French coursesLeave a comment on ﻿Watch Your Way To Learning French–Part 29! Watch Your Way To Learning French–Part 28! Author AlbertPublished on 29 March 2019 13 April 2019 Leave a comment on Watch Your Way To Learning French–Part 28! Learn what to say to your girlfriend if her shopping gets too heavy on your poor wallet, with this next video lesson by Albert Learning. Write your answers in the comment section below. Exercise: Write ‘Right’ or ‘Wrong’. 2) Tant is 'to wear/to carry'. 6) Tomber is 'to fall down'. 7) Toi is 'to follow'. 8) Porter is 'to return/to give back'. 10) Suivre is 'while/as long as'. Published on 29 March 2019 13 April 2019 Categories Learn FrenchTags Albert learning, Basic French words, French courses, French language, French lessons online, French vocabulary, Learn French online, online French coursesLeave a comment on Watch Your Way To Learning French–Part 28! Watch Your Way To Learning French–Part 23! Author AlbertPublished on 23 June 2018 13 April 2019 Leave a comment on Watch Your Way To Learning French–Part 23! Learn the best way to form a question, and how to answer them in Lesson 23. Solve the exercise given below for more practice. Exercise: Put the conversation in the correct order. 1- Vous voulez aller lui dire bonjour pendant qu’il est là? 2- Oui, c’est une bonne idée. Peut- être il est devenu plus sage avec l’âge. 3- Est-ce que vous connaissez le vieil homme qui est en face de ce bâtiment? 4- Nous devons lui acheter un cadeau dès que possible. 5- Oui. Enfin, il est revenu après plusieurs années. Peut-être il a fini sa carrière dans le service public. Visit our website (www.albert-learning.com) to learn more! Published on 23 June 2018 13 April 2019 Categories Learn FrenchTags Basic French words, French conversation, French courses, French language, French lessons online, French vocabulary, Learn French Albert learning, Learn French online, online French coursesLeave a comment on Watch Your Way To Learning French–Part 23! Watch Your Way To Learning French–Part 22! Author AlbertPublished on 11 June 2018 13 April 2019 Leave a comment on Watch Your Way To Learning French–Part 22! Ever bargained with your parents for extra cash? Or are you the parent, wondering how much money your child will ask for next? Whichever side you fall on, this next video is for you. Happy negotiating (or refusing)! Further sharpen your skills by solving the exercise given below. Published on 11 June 2018 13 April 2019 Categories Learn FrenchTags Basic French words, French courses, French language, French lessons online, French vocabulary, Learn French Albert learning, Learn French online, online French coursesLeave a comment on Watch Your Way To Learning French–Part 22! Watch Your Way To Learning French–Part 21! Author AlbertPublished on 6 June 2018 13 April 2019 Leave a comment on Watch Your Way To Learning French–Part 21! You are the proud knowledge-seeker with 200 new French words running around in your brain! Raise that number to 210 by watching this video. Solve the below exercise to practice what you have learnt. Exercise: Write True or False for the following sentences. 2- “Beaucoup de gens la trouvent chère.”- In this sentence, ‘chère’ means ‘dear’. 3- “Vous pouvez aller à pied ou en voiture”, translates to “You can go by foot or by car”. 4- “La table coûte 100 €!”- In this sentence, the word “€” means “cent”. 5- “En bas il y a plus de tables, qui sont moins chères.”- In this sentence, “il y a” translates to “down”. 7- “OK! Où sont tous les autres magasins de meubles?”- In this sentence, “tous” means “table”. Published on 6 June 2018 13 April 2019 Categories Learn FrenchTags Basic French words, French conversation, French courses, French language, French lessons online, French vocabulary, Learn French Albert learning, Learn French online, online French coursesLeave a comment on Watch Your Way To Learning French–Part 21! Watch Your Way To Learning French–Part 20! Author AlbertPublished on 22 May 2018 13 April 2019 Leave a comment on Watch Your Way To Learning French–Part 20! If you are watching the videos (in numerical order), and actually remember what you were taught, then you now know 190 words in the French language. Today’s video rounds off that number at 200 words, teaching you a few quantifiers, along with a sprinkling of verbs. Exercise: Correctly identify what the highlighted word translates to, in English. 1-Maman, je veux rencontrer mes amis et jouer avec eux. 2-Oui! Je ne serai pas en retard. 4-Ça fait plusieurs jours que tu ne les a pas vus. 5- Pourrais-tu me les présenter? 6- Oui, ça fait un bail. 7- Après, tu peux sortir à 18h, mais tu dois revenir bientôt. 8- Oui! Je ne serai pas en retard. 9- Tu peux inviter chacun d'entre eux. Published on 22 May 2018 13 April 2019 Categories Learn FrenchTags Basic French words, French courses, French language, French lessons online, French vocabulary, Learn French Albert learning, Learn French online, online French coursesLeave a comment on Watch Your Way To Learning French–Part 20! Watch Your Way To Learning French–Part 19! Author AlbertPublished on 17 May 2018 13 April 2019 Leave a comment on Watch Your Way To Learning French–Part 19! The following video teaches you exactly how to book tickets for that movie you like. Of course, comprehending the plot and dialogues will take a lot more videos and lessons, but keep visiting our blog and website; we'll get you there. Promise! You watched the video, now solve the exercise to practice what you learnt. Exercise: Choose the correct answers to the following statements. 1- Madame, je voudrais un billet pour le film. a) Le théâtre ouvre à 9h et le film commence à 09h15. 2-Je viens souvent ici pour voir des films. a) C’est vrai? Très bien! b) Madame, je voudrais un billet pour le film. a) Ah non! Ecoutez, ce sera pour cinq membres. 4- Le théâtre ouvre à 9h et le film commence à 09h15. Published on 17 May 2018 13 April 2019 Categories Learn FrenchTags Basic French words, French conversation, French courses, French language, French lessons online, French vocabulary, Learn French Albert learning, Learn French online, online French coursesLeave a comment on Watch Your Way To Learning French–Part 19! Watch Your Way To Learning French–Part 18! Author AlbertPublished on 11 May 2018 13 April 2019 Leave a comment on Watch Your Way To Learning French–Part 18! You now know 160 words in French, enough to ask for directions if you ever went to France. Here’s another 10 words to make your conversation so much easier. Solve the following exercise to practice what you have learnt. Write the answers in the comment section below. Exercise: Write the sentences in the correct order. 1- Bonjour, vous ce sentez mieux vous matin? 3- On vous donnera donc moins de maintenant médicaments. 4- Quelqu'un venu vous pour est voir? 5- Déjà oui frère est mon venu. 6- Cherchait oui, vous il. 7- De mais aucun voir mes amis venu me n'est avant! Click here to read the precious post. Published on 11 May 2018 13 April 2019 Categories Learn FrenchTags Basic French words, French courses, French language, French lessons online, French vocabulary, Learn French Albert learning, Learn French online, online French coursesLeave a comment on Watch Your Way To Learning French–Part 18! Watch Your Way To Learning French–Part 17! Author AlbertPublished on 2 May 2018 13 April 2019 Leave a comment on Watch Your Way To Learning French–Part 17! After 16 lessons, we now expect you to carry on a fluent conversation in French. With adequate practice, you should be able to form at least 5 (if not more) sentences in French. Here are 10 more words to add to your list. Based on the video, solve the exercise and write the answers in the comment section below. Exercise: Look at translation in English and choose the correct word in French. Published on 2 May 2018 13 April 2019 Categories Learn FrenchTags Basic French words, French conversation, French courses, French language, French lessons online, French vocabulary, Learn French Albert learning, Learn French online, online French coursesLeave a comment on Watch Your Way To Learning French–Part 17!